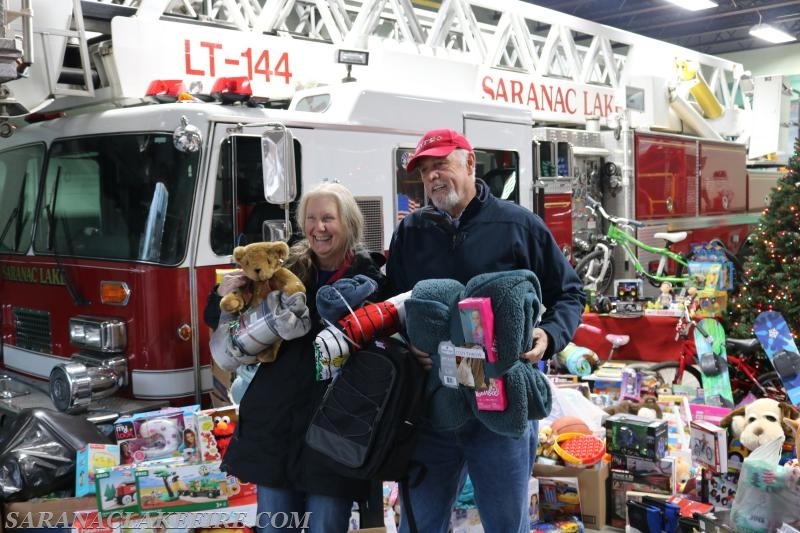 Saranac Lake showed up big time!!! 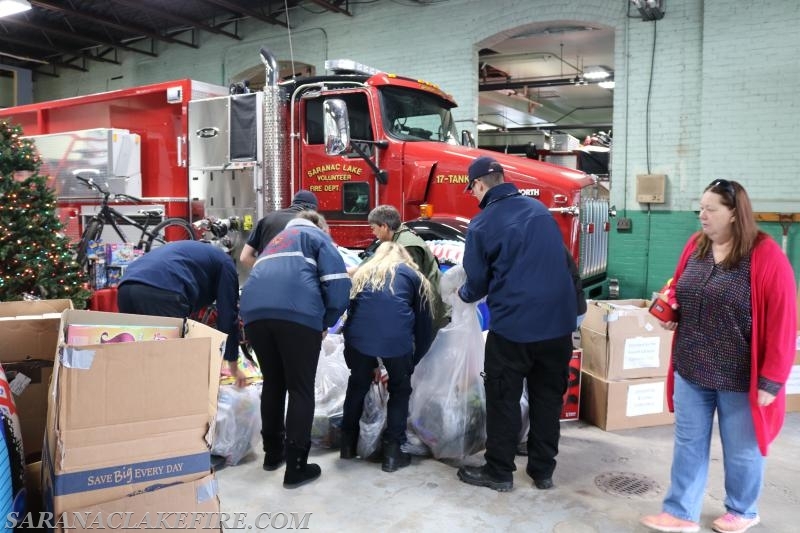 The holiday helpers toy drive was so successful it took 3 trucks to move all the presents from the fire house to North Star Industries where the "Holiday Helpers" will sort, organize and distribute the gifts. 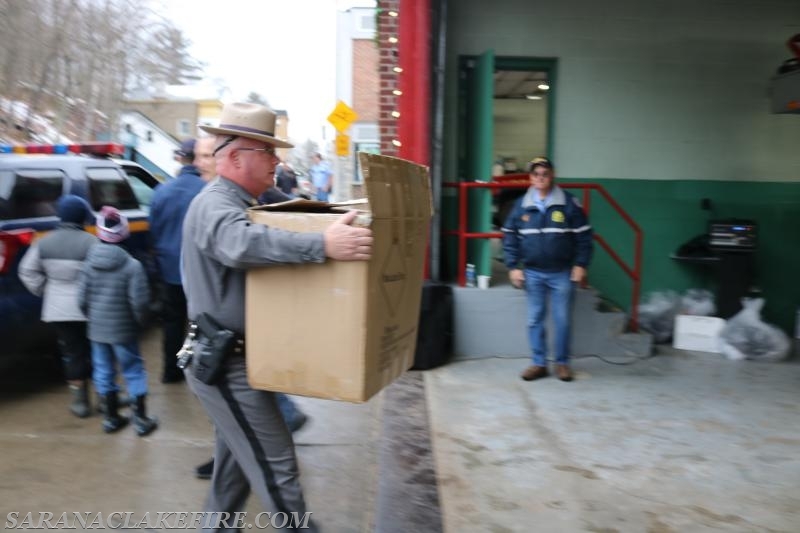 When you remove cots and equipment from rescue trucks, what is left is basically a big box truck. 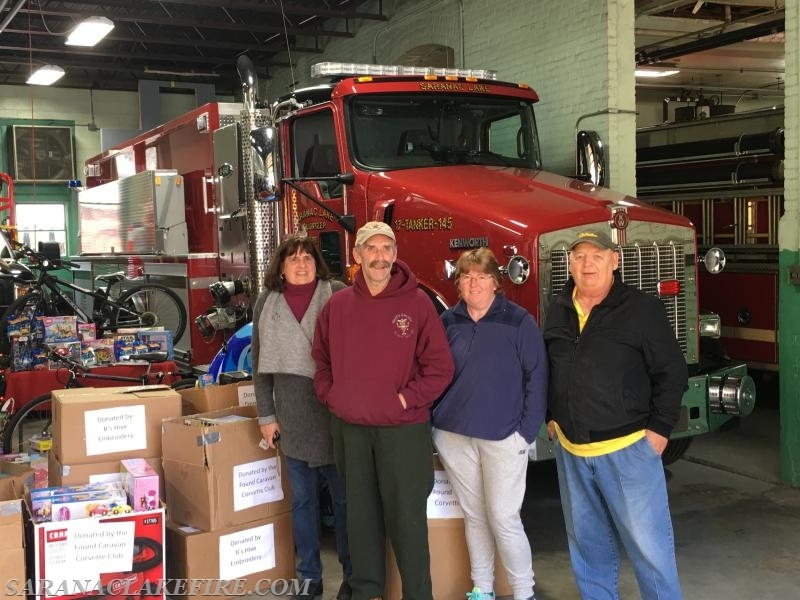 When we were done, your generous donations filled to overflowing SLVFD's heavy rescue 147, SLVRS's rescue 549, and a members personal pick up truck. 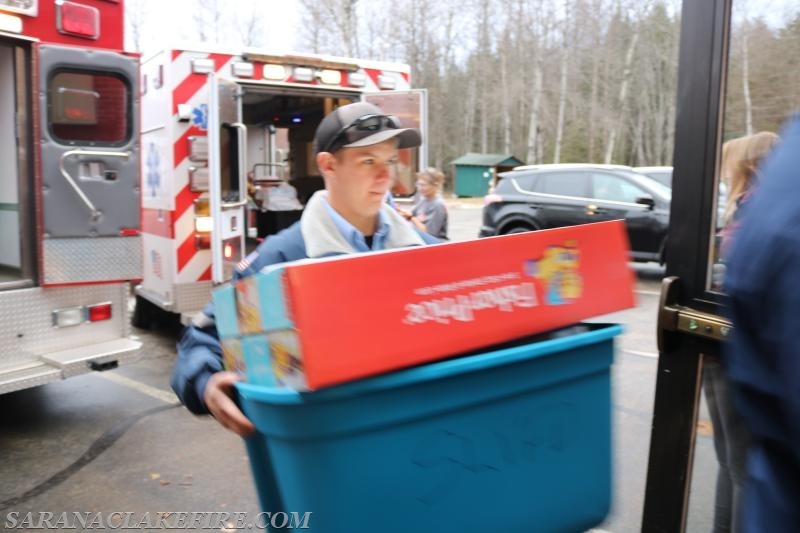 To say the scene was "moving" would be an understatement. 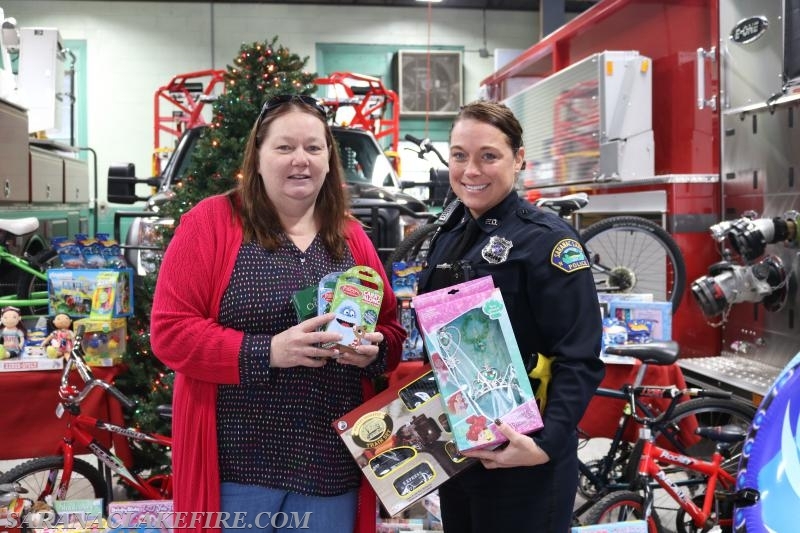 Patti Ploof and Dawn Rogers, Co-Chairs of the Holiday Helper organization were on hand throughout the event. 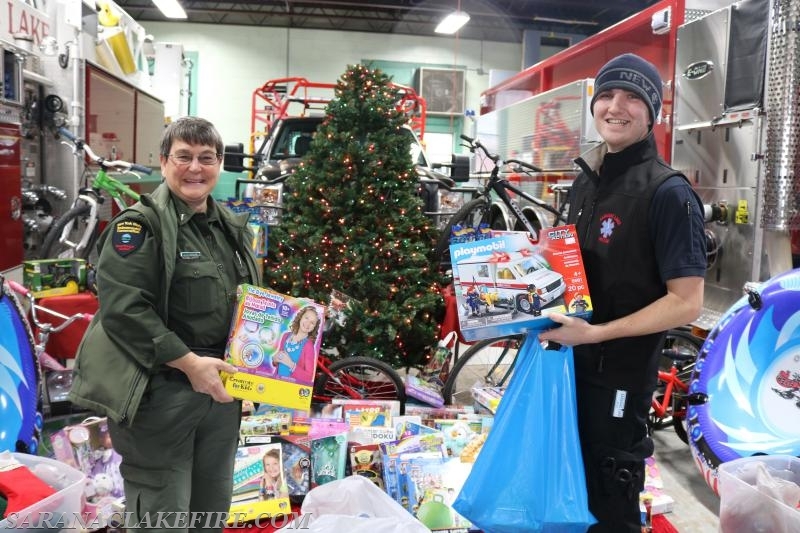 Patti said "Once again the community has come together to ensure 203 children from 96 families will have a very merry Christmas indeed. 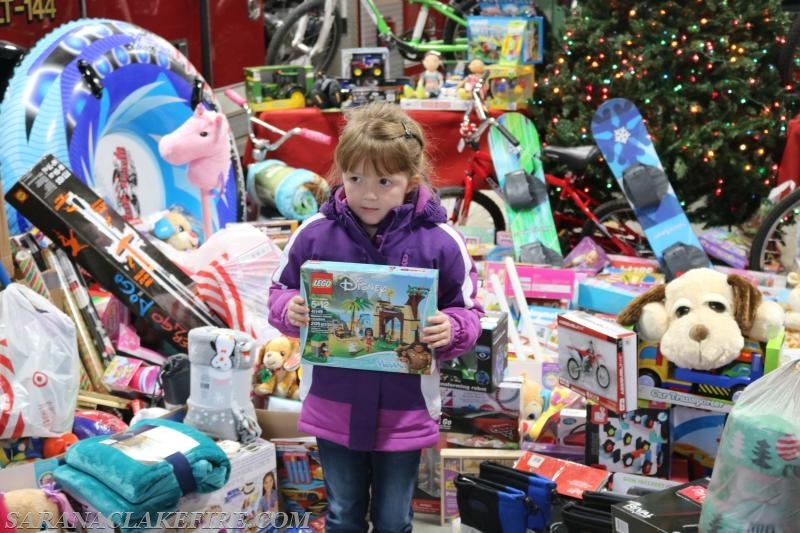 From the littlest elves to the adult groups - it's so great to see everyone bringing in toys to help a child in need. 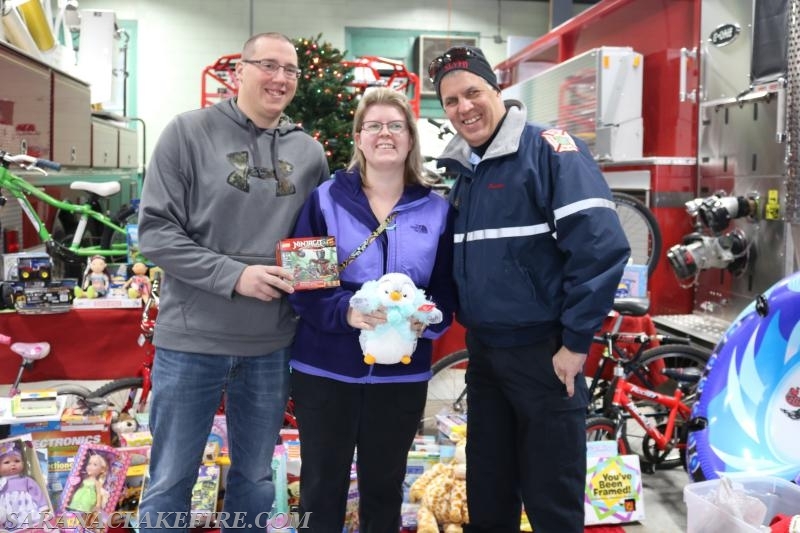 We are forever grateful to the SLVFD for hosting this toy drive. 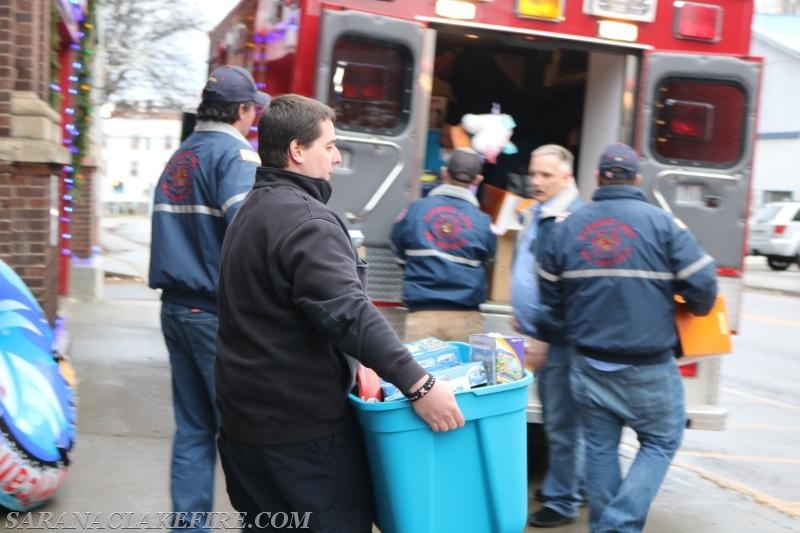 What an amazing group - not only for making us feel so welcome and feeding us (Thanks Eva Stinson), but all the lifting and moving of the toys from the firehouse to our distribution site. 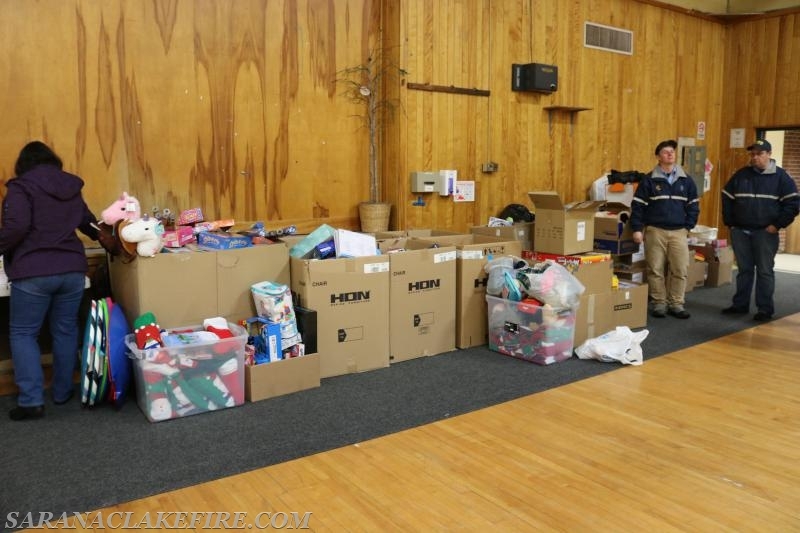 Holiday Helpers only exists because of our community's generosity!" 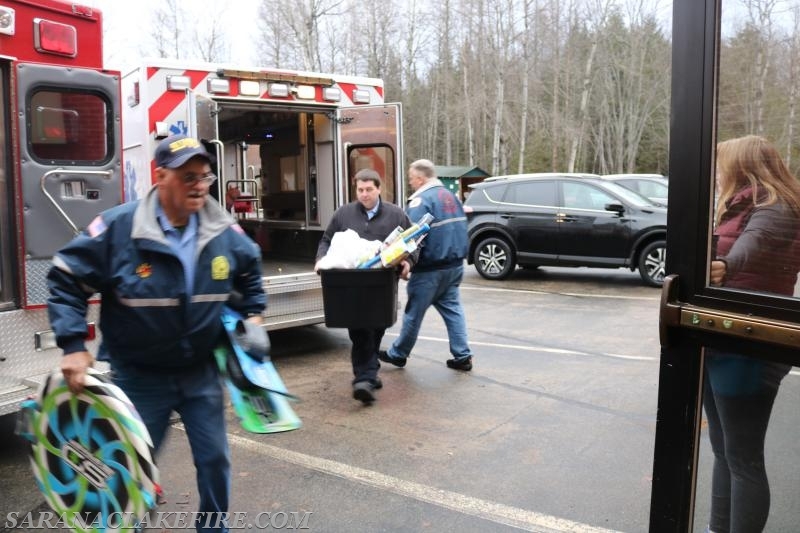 While the SLVFD hosted the drop off location for the event, so many first responder organizations, groups, and individual community members contributed so much, We at the SLVFD can only say "Wow" and "Thank You" "We live in and serve a very special community". 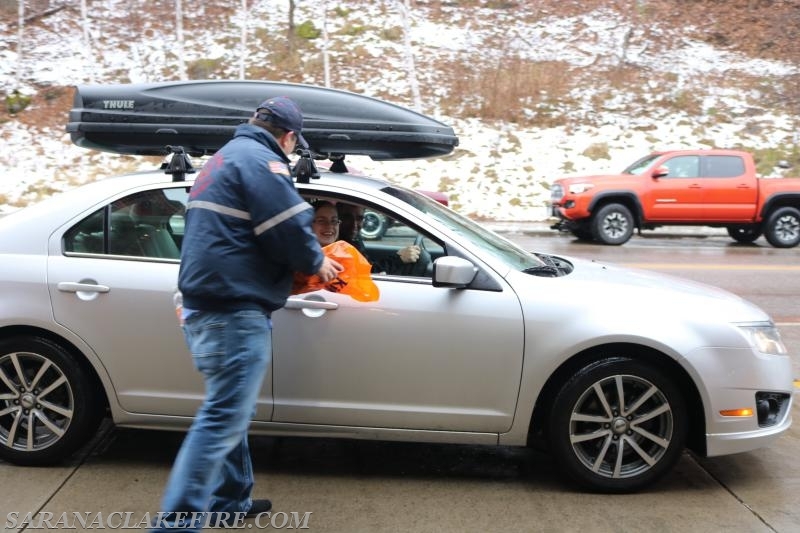 Please enjoy the photo's taken throughout the day. 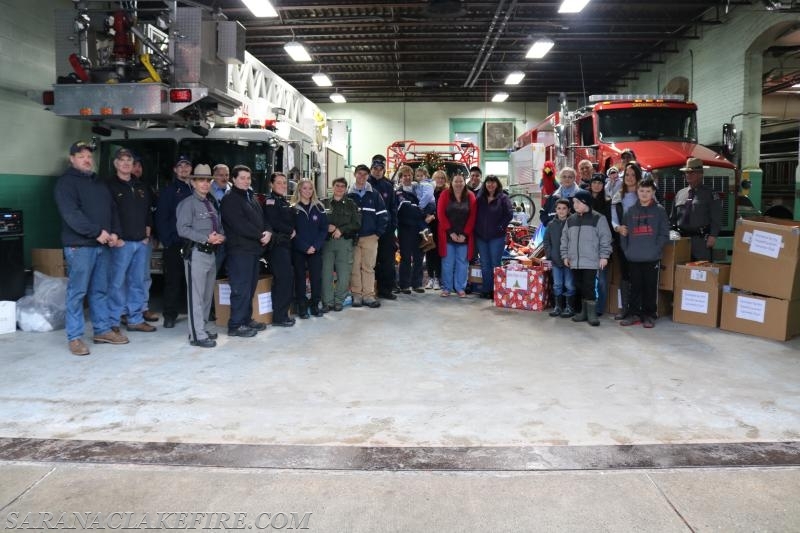 As part of the holiday cheer, SLVFD members decorated the station. 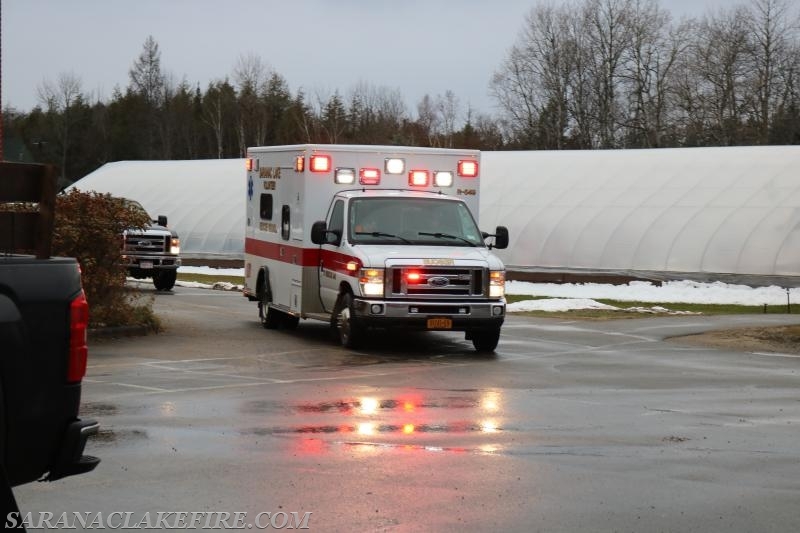 Here SLVFD Dive Captain Ken McLaughlin affixes lights above the first bay doors. 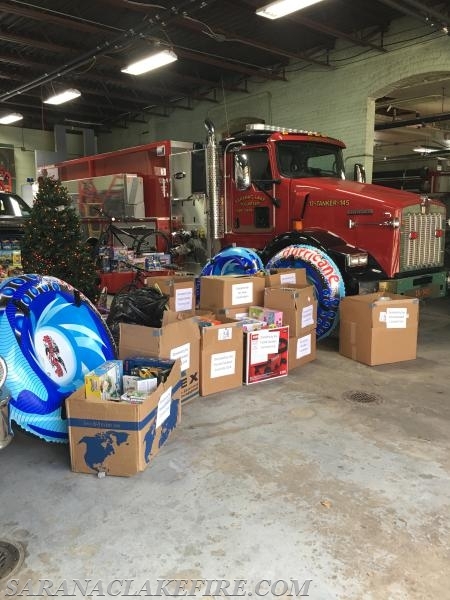 As part of the holiday cheer, SLVFD members decorated the station. 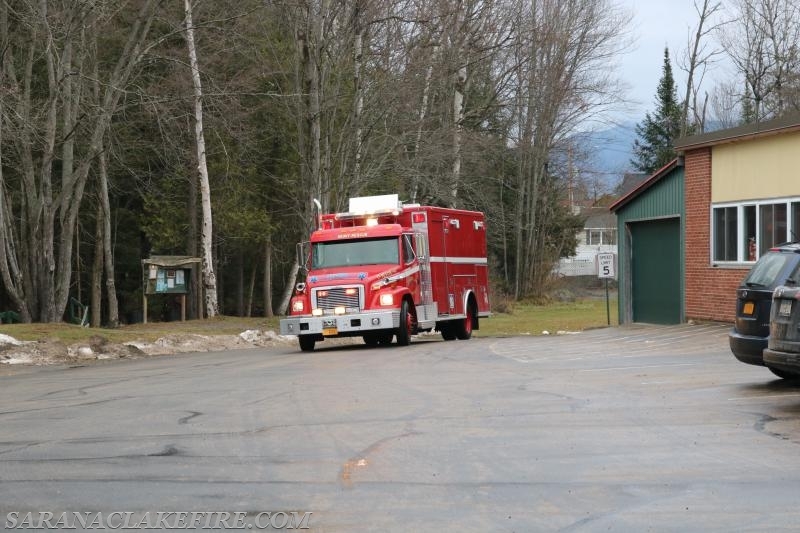 Here L-R Firefighter Mark Villa, Director Jim Stinson, and Assistant Chief Andy McGill place lights above the second bay door. 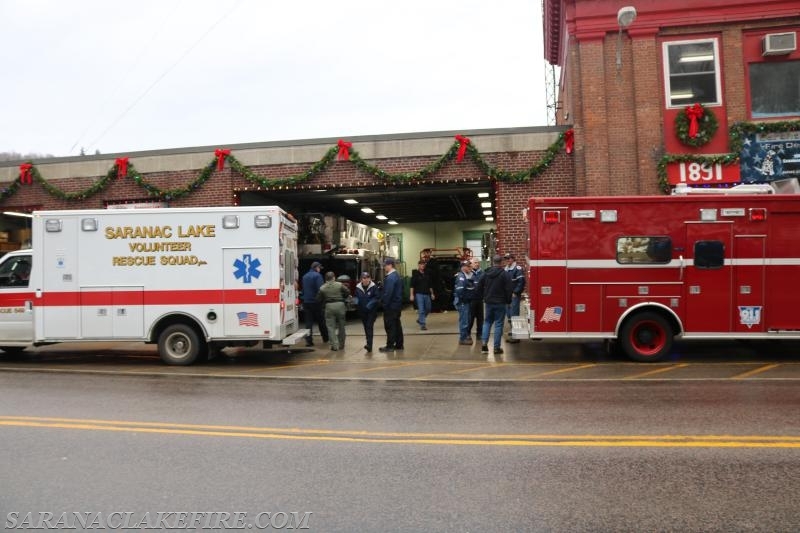 As part of the holiday cheer, SLVFD members decorated the station. 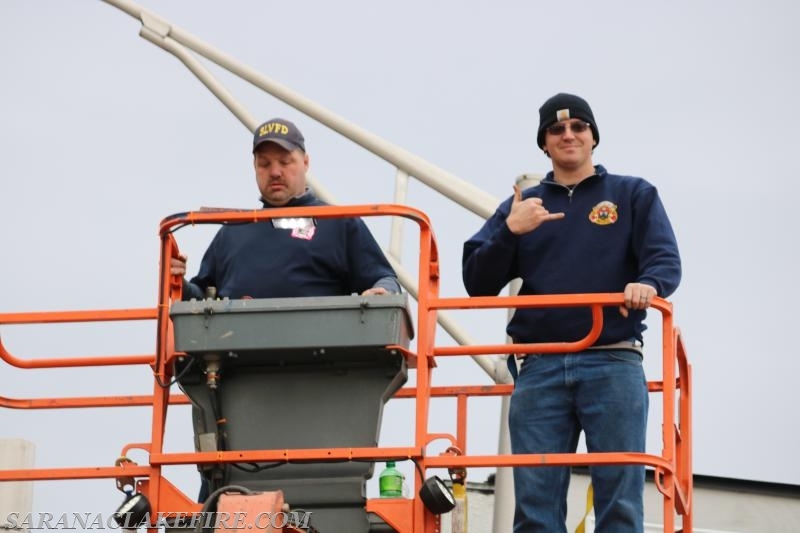 Firefighter Michael Knapp and Fire Captain Doug Peck in elevated position decorating the station. 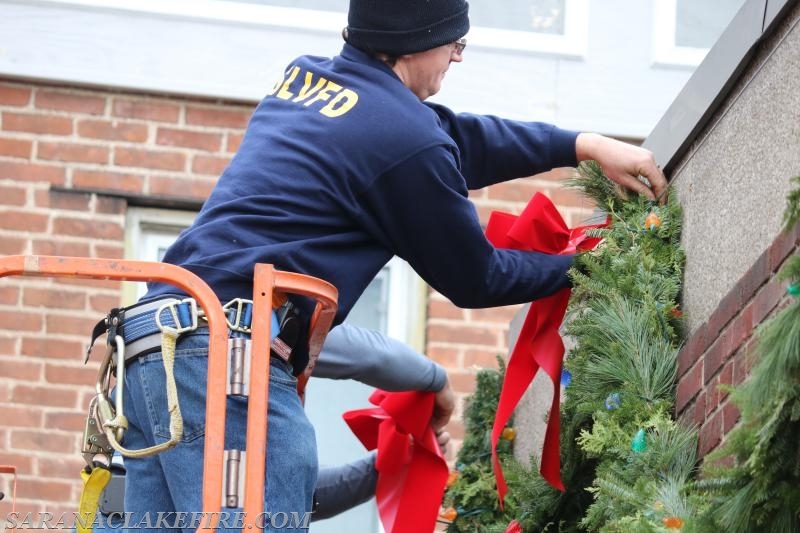 As part of the holiday cheer, SLVFD members decorated the station. 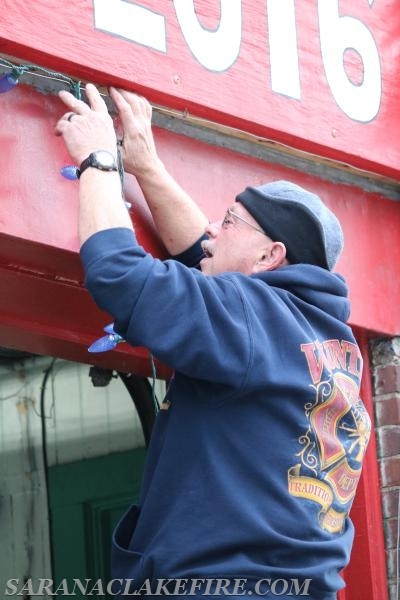 Here Fire Captain Doug Peck Places decorations above the third bay doors. 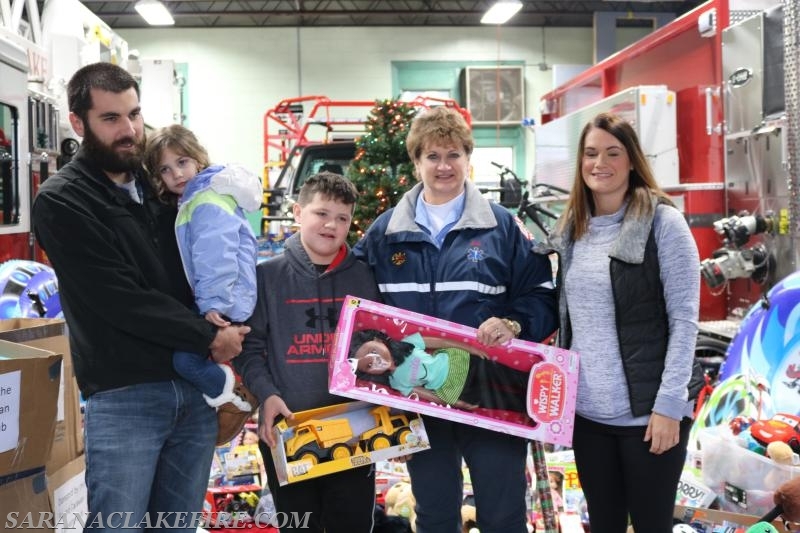 An early drop off was made prior to 10:00am from the "Found Caravan Corvette Club" and "B's Hive Embroidery"
Community members showed up throughout the day with presents for Holiday Helpers. 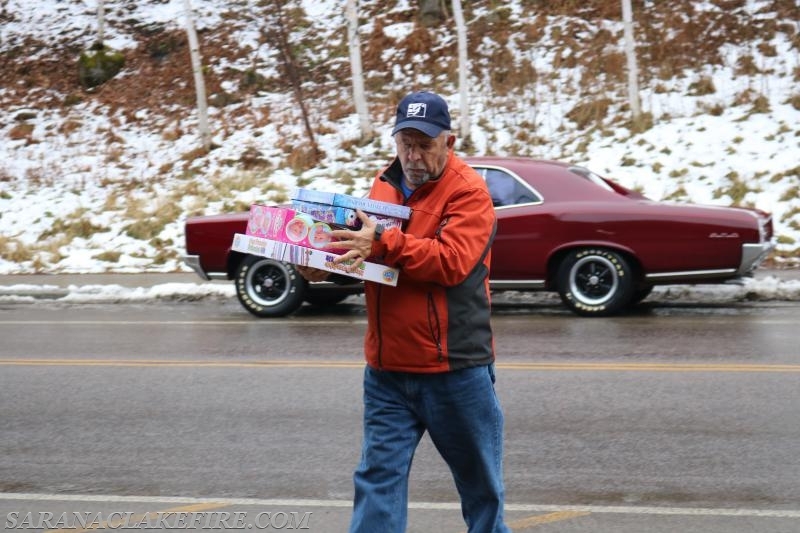 Vehicle drive by's with donations were a common occurrence throughout the day. 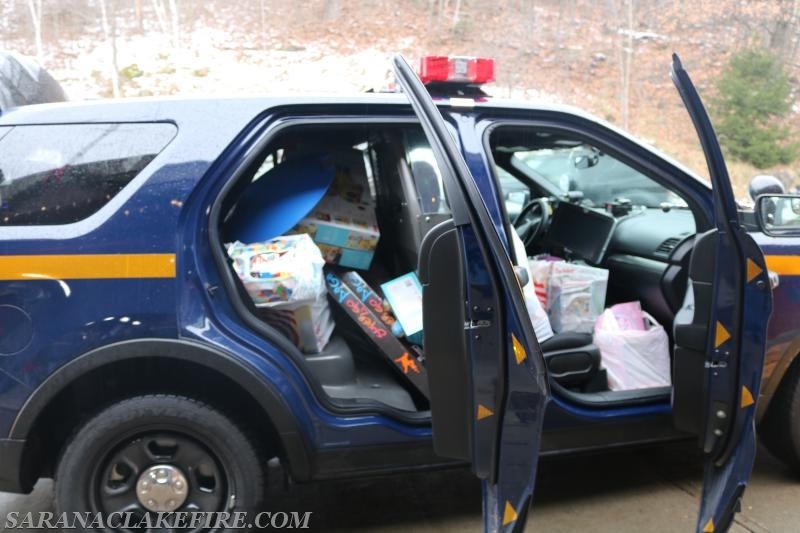 a growing pile of toys. 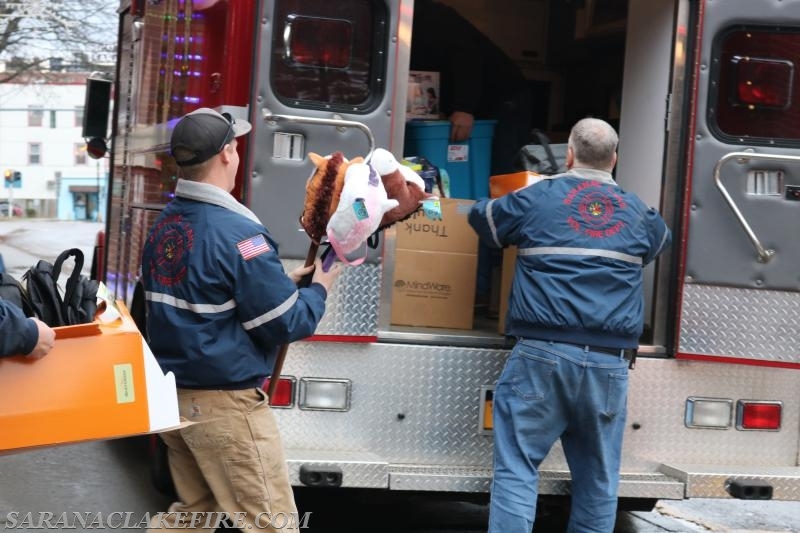 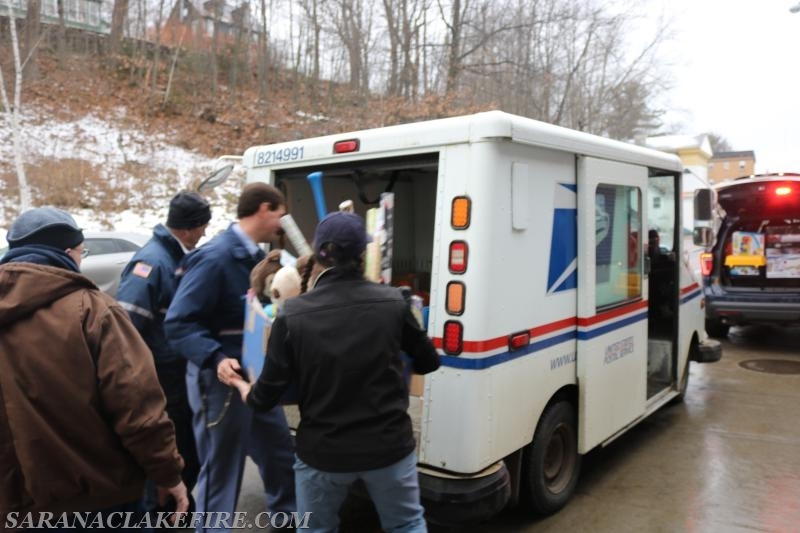 Saranac Lake Postal employees, showed up with a mail truck full of toys. 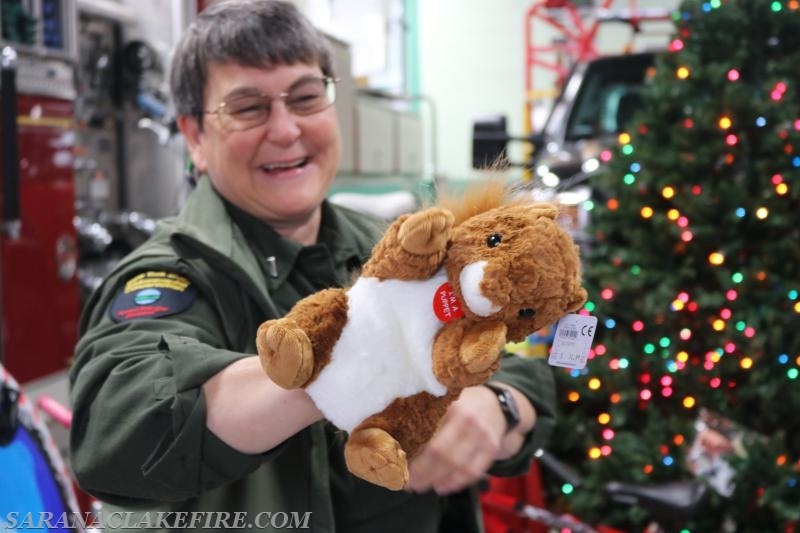 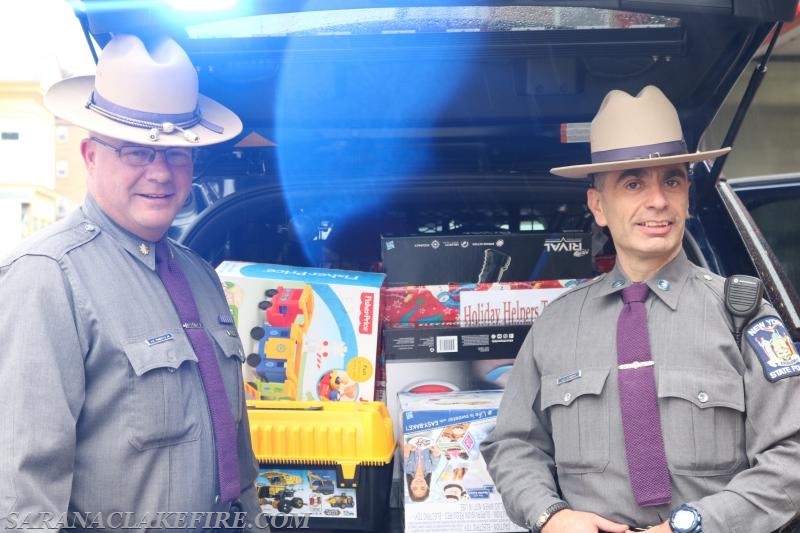 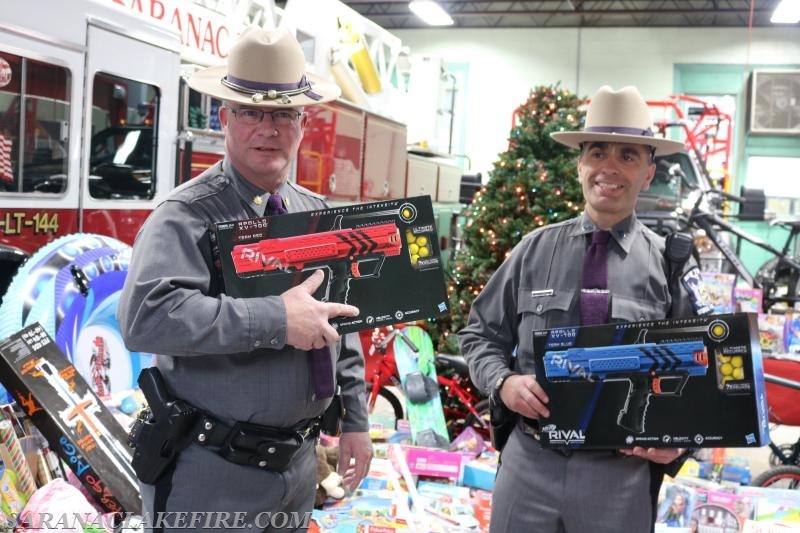 NYSDEC Forest Ranger, Lieutenant Julie Harjung drops off Toys for the Holiday Helpers. 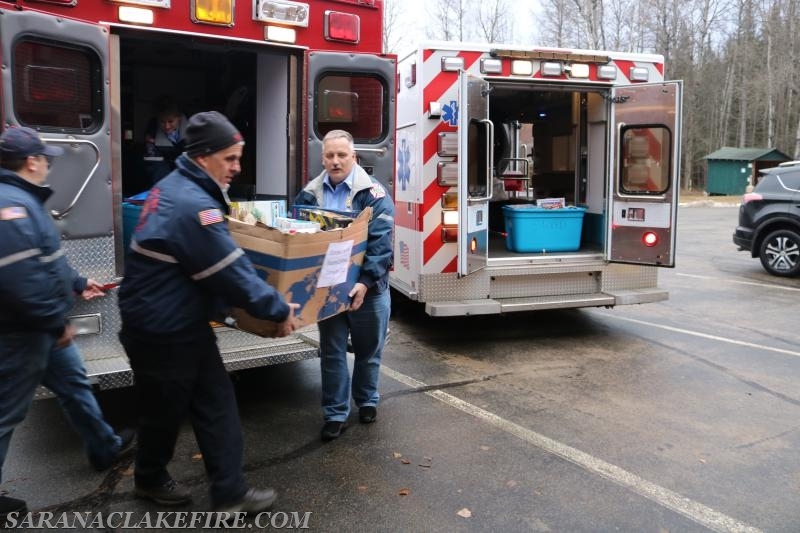 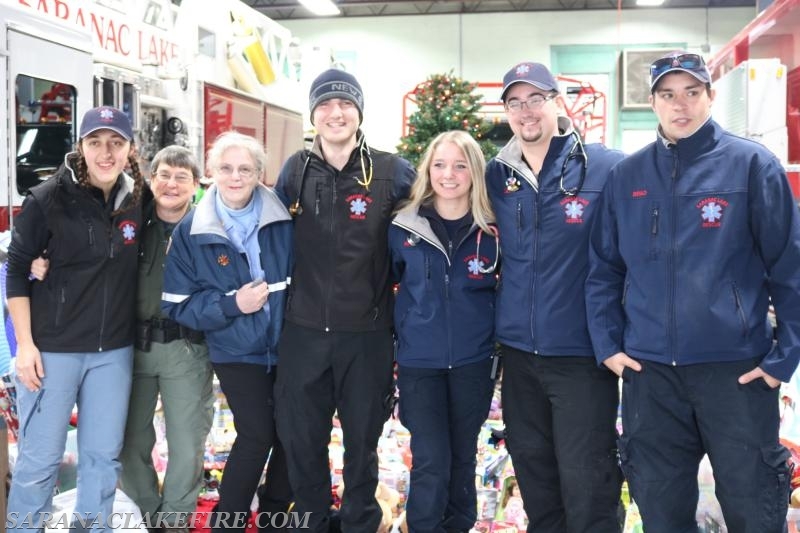 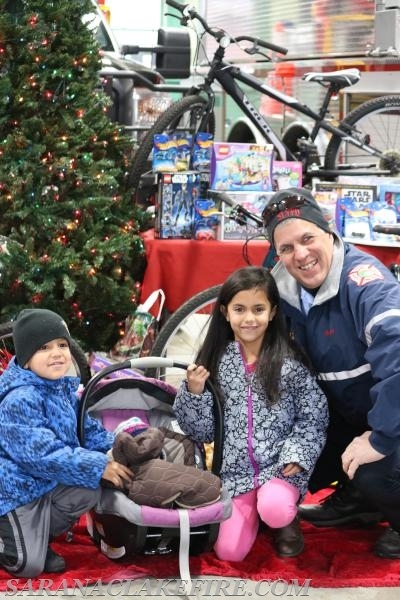 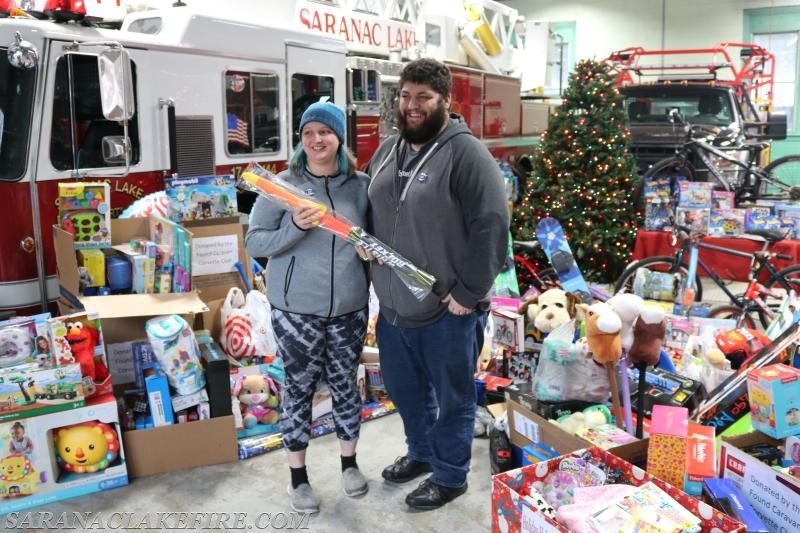 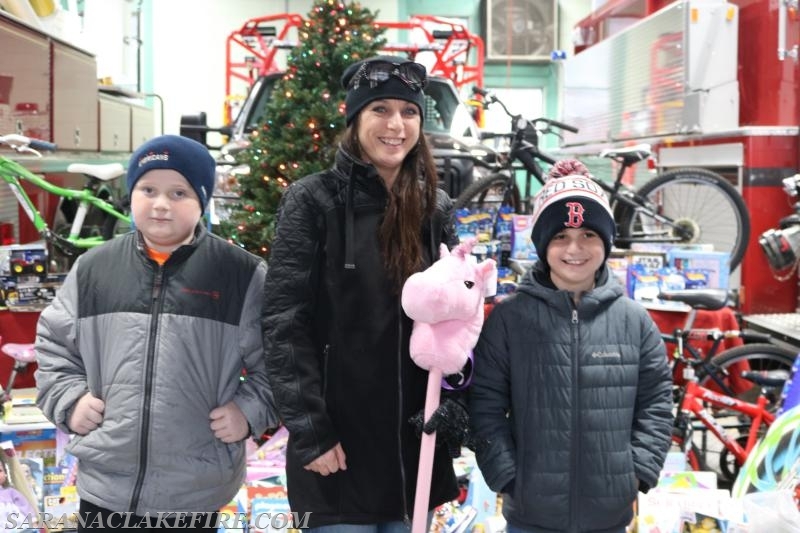 Saranac Lake Volunteer Rescue Squad members showed up with a large contribution to the Holiday Helpers. 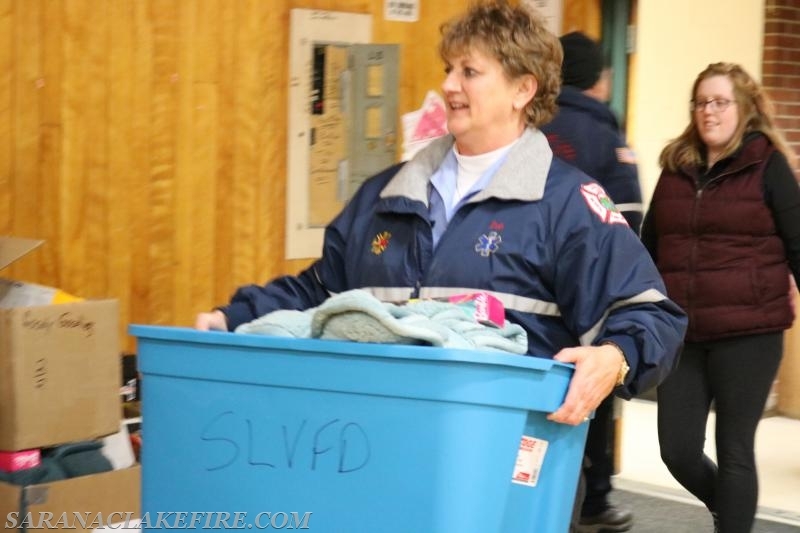 Patti Ploof receives donations from the SLPD from Officer Reyanin Peck. 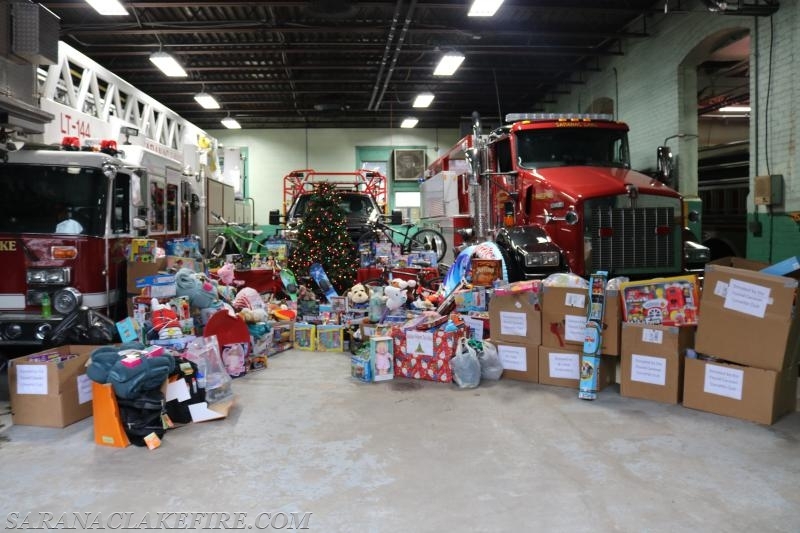 At the end of the day, a huge pile of toys had to be transported to Northstar Industries where the Holiday Helpers crew will sort and organize the gifts for distribution. 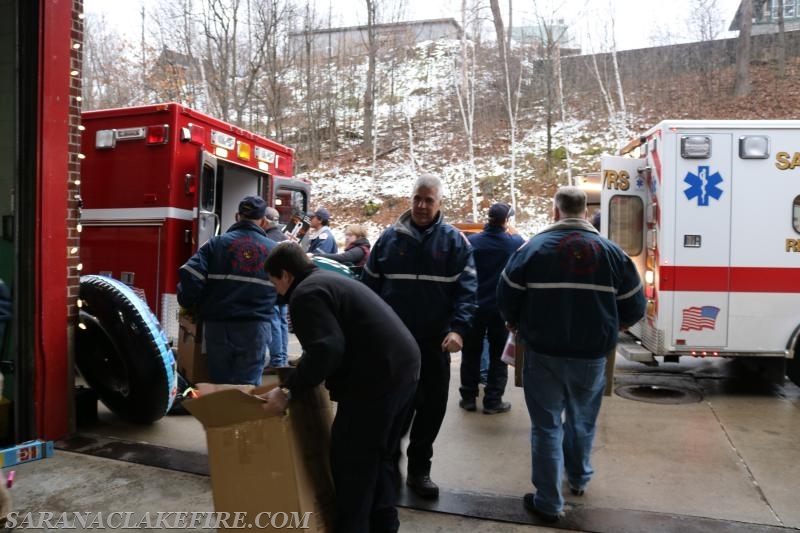 Two emergency vehicles converted to temporary box trucks prepare to be loaded. 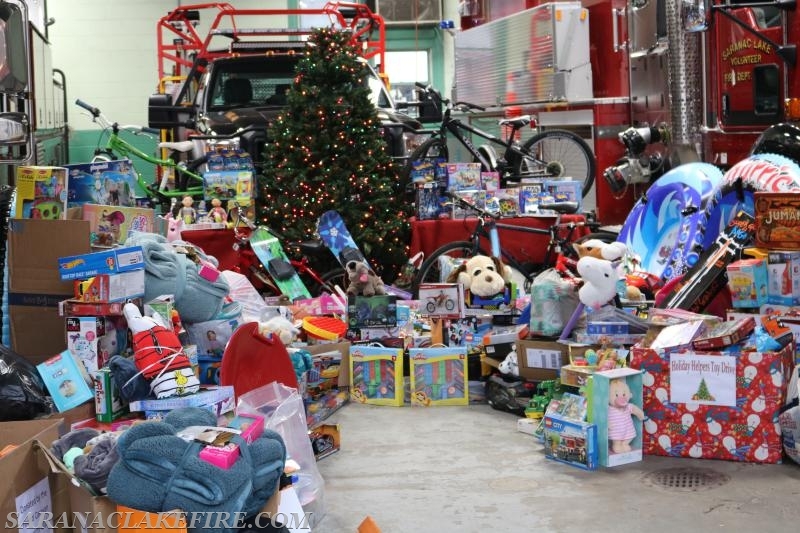 SLVFD Heavy Rescue 147 arrives at Northstar Industries filled to the top with Toys. 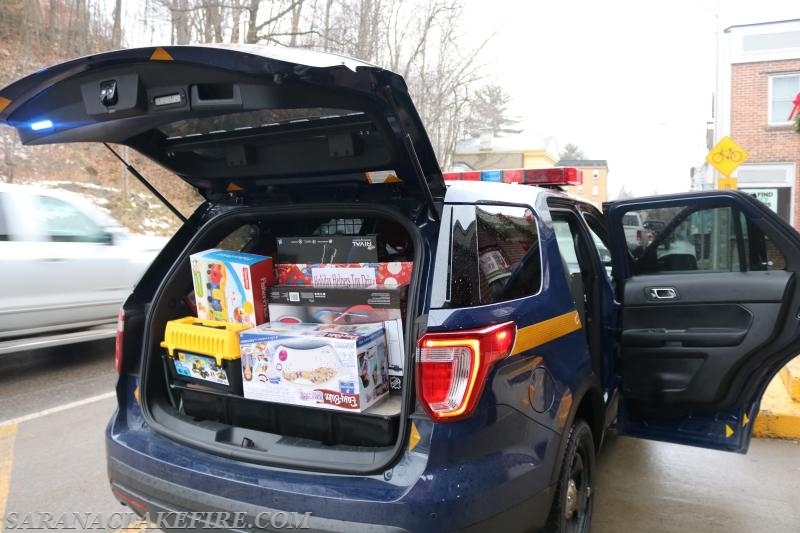 SLVRS Rescue 549 followed by a members personal pick up truck arrive at Northstar Industries filled to the top with Toys. 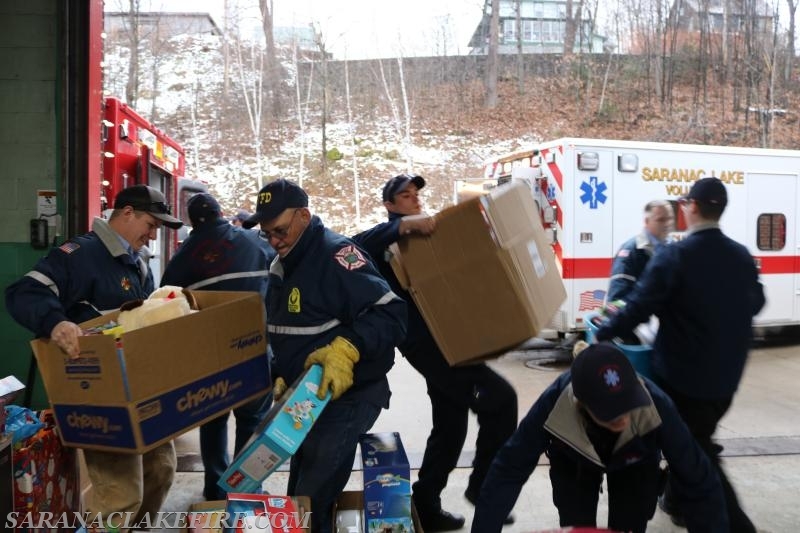 SLVFD and SLVRS members deliver the toys to the distribution center. 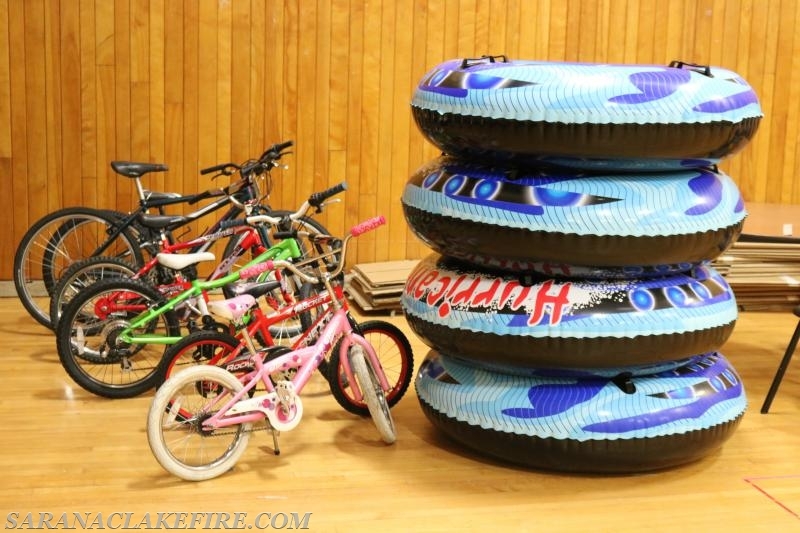 Bikes and Tubes delivered to the distribution center at Northstar Industries. 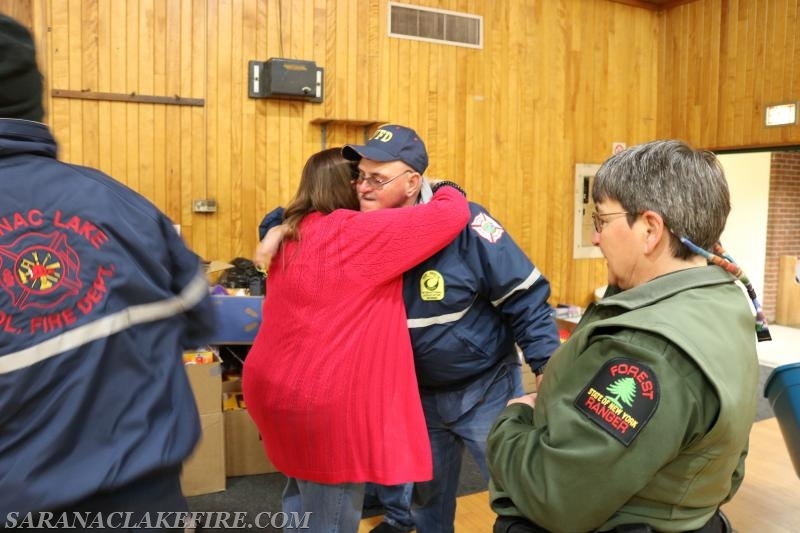 Holiday Helpers Co-Chair Patti Ploof hugs SLVFD Assistant Chief Andy McGill. 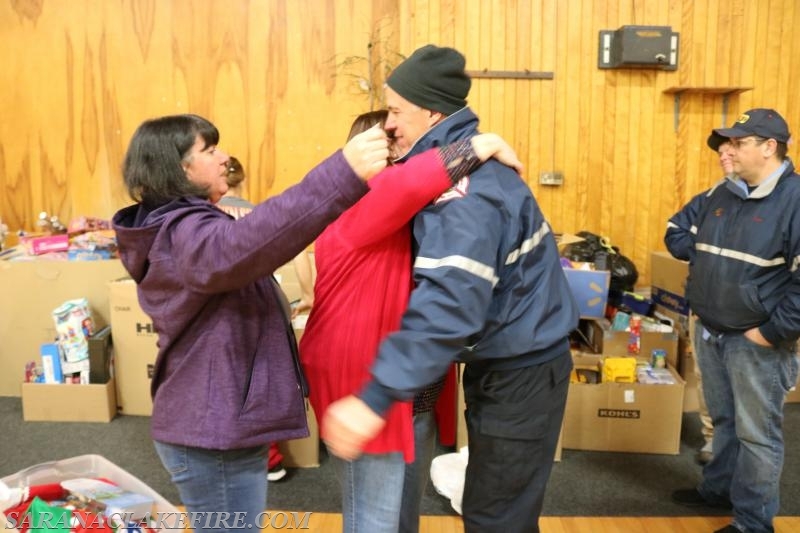 Holiday Helpers Co-Chairs Patti Ploof and Dawn Rogers give SLVFD Chief Brendan Keough a hug at the end of the day. 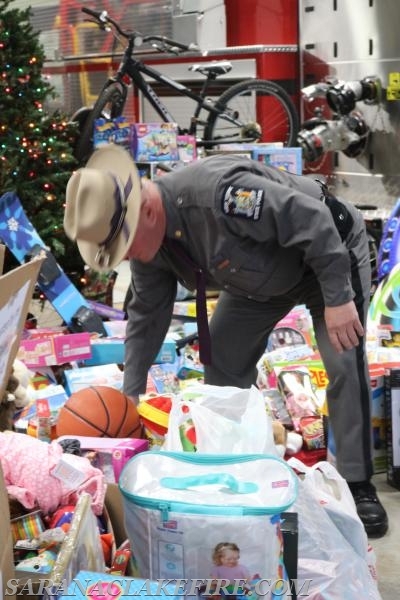 Toys lined up in boxes at the distribution center. 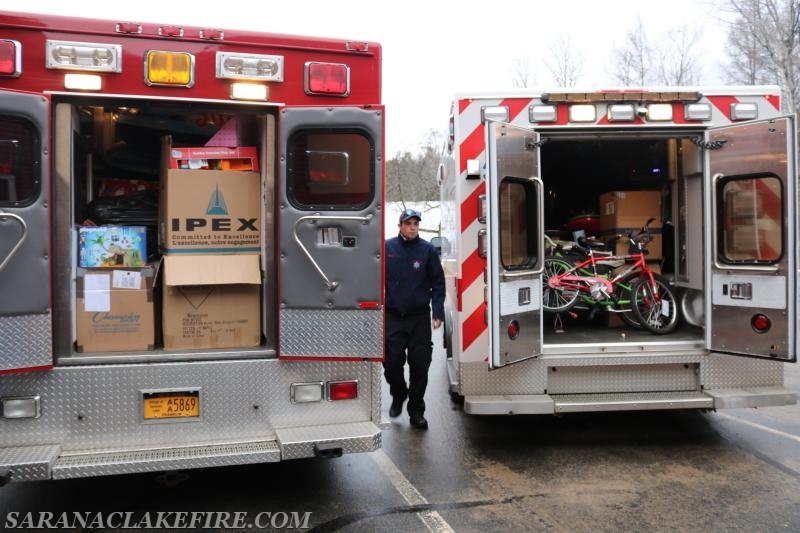 A look inside two really full emergency vehicles on a cheerful mission.